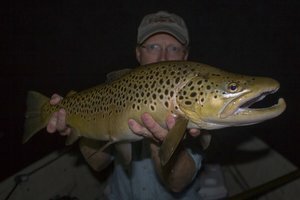 First brown of the year nailed a white streamer and wanted it in a bad way. The fish swirled on the fly once so I threw back and it inhaled the fly like it was the last meal it would get. 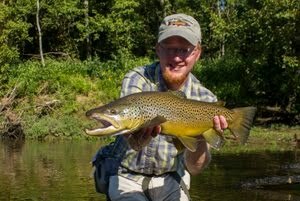 Not a bad way to kick off another year of fishing for browns! Fishing can be a real task sometimes, especially when the fish are being selective or when they are hard to locate. With wild fish we expect refusals, breakoffs, and sometimes they are even difficult to find. Stockers are another thing. Normally they eat anything and then fight half-heartedly for a few seconds before rolling over and being brought to hand. Yesterday I went searching for some stocked rainbows in a nearby lake. Occasionally in the cold months, I will take advantage of the local stockers more out of curiousity than anything else. My standard pattern is a smallish bead head Simi Seal Leech. Once I catch a couple I start to experiment. 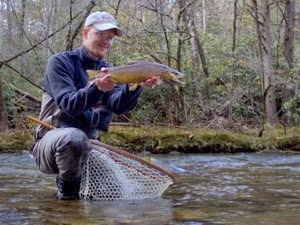 Afterall, it is a little interesting to find out a list of things trout will hit when they are dumb enough, nevermind that some people don't even count these stockers as worthy of the name trout. The standard procedure is pretty much to find a place where I can cast and start stripping the fly anywhere from just under the surface to really deep. If the fish are around that normally will pick up a few. When I arrived on the water, the lower end of the lake was heavily stained, some would even say muddy. My hopes for good fishing began to dwindle when I had an idea. This trip was going to require a little more searching than I normally would do. Walking along the trail, I enjoyed the cool fresh air. The breeze was light and the temperature in the low 50s felt a lot more like late fall or early spring, definitely not the middle of January. A quick stop to stick my hand in the lake jolted me back to reality. The water was definitely cold so any hope of picking up a few bluegill was fading quickly. As I continued along the upper end of the lake, I had a very specific spot in mind. When I was almost there, I heard the type of splash that can only be a fish. Quickly searching the water before the ripples vanished, I located the fish. It was hanging in the current as I was now in an area where the lake narrowed to the receive the creek that was its main water source. Another fish soon made its presence known, and I set about finding a good spot to cast from. 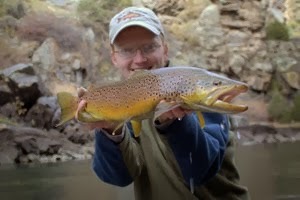 The first three casts were a little short of my intended target but the fourth one was perfect, and soon I saw a small trout appear out of the off-color creek water to nail the leech pattern. Now I was glad that I brought my rarely fished 3 weight. The fish fought much better than it would have on anything heavier and the rod is so light that it feels like I'm fishing with nothing at all. 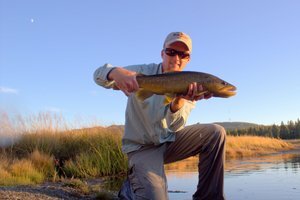 After landing the trout, I stood up and aimlessly flicked my fly back out into the creek in preparation for another real cast. Immediately another fish flew up to hit it and it was game on. This time, I worked the fish in close and then left it in the water while I got the camera out. Some of my friends question whether or not I really catch fish as often as I claim so I document a catch every now and then, even if it really isn't very noteworthy. These rainbows were all looking pretty healthy. Their fins had mostly grown back and while they are still a bit pale, that should all change by the time the spring hatches really kick into high gear. About this time I started to wonder what were the fish actually rising to. Have you ever been out fishing only to realize that you have no idea what the fish are really up to? My first guess of midges proved to be the correct one. It was more of an educated guess than anything and it took me a little while before I actually noticed the tiny light gray insects on the surface of the water and occasionally flying by. Thankfully, the fish were still uneducated enough that I didn't need any 7x and #28 dry flies, and occasionally its nice to fish for something a little less demanding. In the end, I landed a total of 4 little rainbows, all of which put an admirable bend in the 3 weight. The search for fish was over, but ironically it was not my eyes but my ears which originally located the fish. I'm thinking more and more about the Smokies. Every time I close my eyes I can see insects drifting lazily down the current as trout rise enthusiastically to spring's bounty. The next few weeks will include a lot of tying in preparation for the spring, but also will probably feature at least one or two trips to the Park to explore the streams in winter. The trout must be happy lately, and if not, I'm sure they will be all next summer. That's because it has rained, and rained, and then rained some more. All this cold water will translate into plenty of cool water for the tailwaters in another 6-8 months or at least we hope. Of course there are a lot of factors that come into play but right now things are looking good. Unfortunately the fishing will continue to be difficult on the tailwaters for the next couple of weeks at least and probably longer for the wade fisherman. I spent a few days at Fall Creek Falls this week and was able to enjoy the highest falls east of the Mississippi (coming in at a little over 250 feet) under much higher flows than usual. The spitting rain and fog made things difficult with the camera meaning I didn't shoot for very long. A few shots are always better than none however and I was reasonably happy with the result.